Thinking of a New York State museum wedding? It’s one of the most unique Albany wedding venues! As an Albany wedding photographer I’ve worked there many times. Every time I’m taken aback by the spectacular view from the terrace right outside the windows where the reception will be held. Ceremonies for a wedding at the New York State Museum often take place on the terrace outdoors. The New York State capitol and the Empire State Plaza are in the background. You’re generally shielded from the elements by the overhang of the museum and by the mass of the building itself. This spot provides for a sweeping city vista behind you as you say your vows. Getting married in downtown Albany usually provides for some nice buildings to use for your Albany wedding photos. As an Albany wedding photographer I have used them all, so I know there are some great locations. But at a state museum wedding, you have such a dramatic view, one that you can’t get anywhere else. And it will be a beautiful urban backdrop for your wedding that your guests will remember. I love to capture beautiful moments my couples share on the wedding day. My approach to the wedding is to photograph moments, not just poses. And this photo speaks just that. It is a beautiful, shared, real wedding day moment, presented only as an experienced Albany wedding photojournalist can. 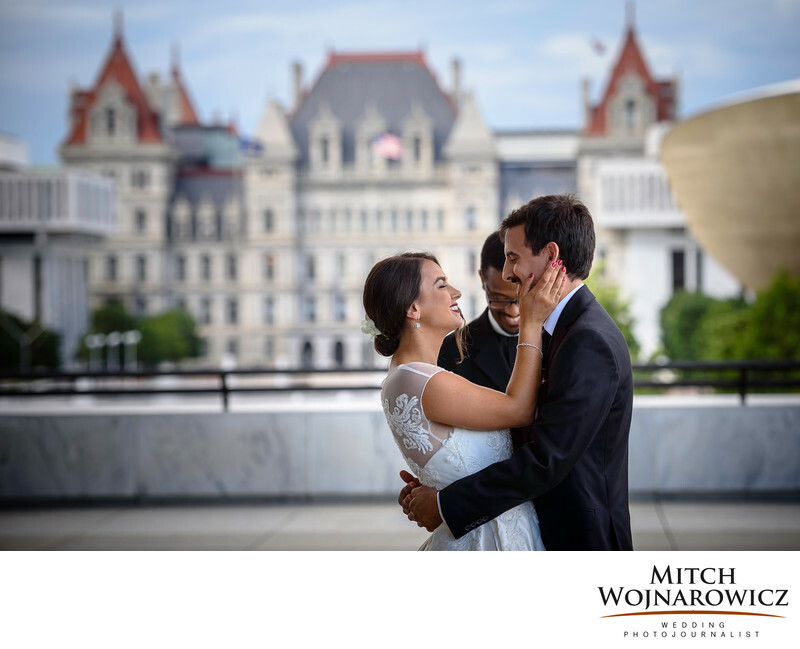 You can have confidence though that as a wedding photojournalist in Albany that you WILL get lots of traditional group photos, only they will be done in a more relaxed fashion. And you’ll get beautiful wedding portraits. But they will be accomplished in smaller bits of photography, carried out throughout the day. There won’t have to be an hours long portrait session where you will spend all kinds of tie posing in all sorts of ays that hold no meaning for you. I'd love to speak with you about your wedding. Just Click Here! Location: New York State Museum. Keywords: albany (45), NY State Museum (3).